Interview by the European University Institute Times about Martina's work and plans for the future. Interview by Forbes about Oral3D. Martina is listed among the 15 most influential Italian women on digital issues. Article by LiveUniCT about FabLab Western Sicily and Forbes award. Martina is listed among the 100 Italians under the age of 30 with a purpose of reinventing the future under the claim 'We Win Worldwide'. 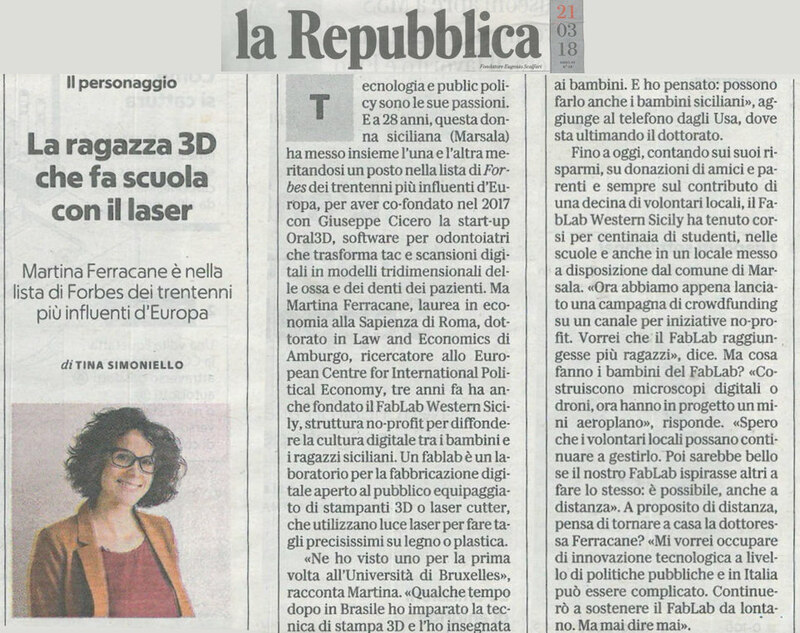 Interview by La Repubblica about Forbes award and FabLab Western Sicily. Infondent writes about Oral3D and Forbes 30 Under 30 award. Millionare.it writes about Oral3D and Forbes 30 Under 30 award. Bloomberg cites ECIPE's report "China’s technology protectionism and its non-negotiable rationales". 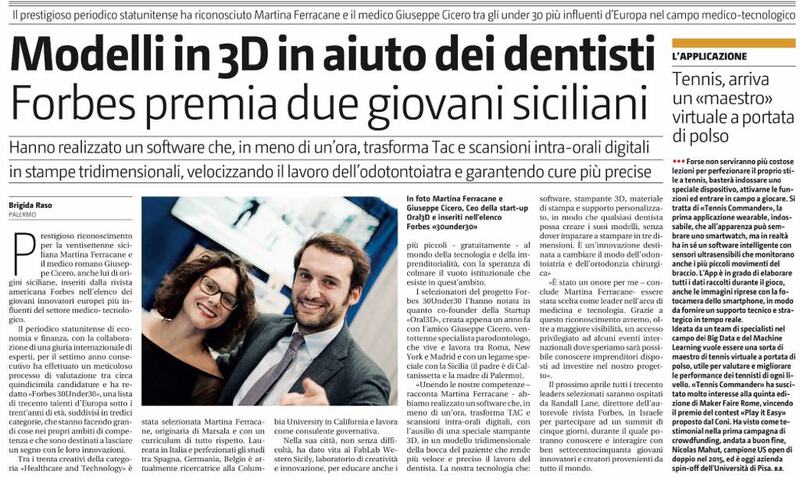 Il Giornale di Sicilia writes about Oral3D and Forbes 30 Under 30 award. SkyTG24 writes about Oral3D and Forbes 30 Under 30 award. Interview by Itaca Notizie about Oral3D. Martina is in Forbes 30 Under 30 List in Science and Healthcare for Europe with her start-up Oral3D. Martina's paper on a proposed taxonomy of data flows restrictions cited by the Financial Times. Martina is interviewed about FabLab Western Sicily. FabLab Western Sicily cited in local media. Martina interviewed about her foundation on digital education. Martina comments on Brexit in local newspaper. Martina interviewed about her social project to bring digital fabrication to Sicilian schools. Article on an event about ISDS held in Bucarest. Relazione Unioncamere Veneto su "ECIPE Seminar: How to accelerate the expansion of the Digital Economy?" [in Italian].